I now find myself living in Florida, in my brother’s warehouse parking lot in a 30′ trailer and calling it home. Within my journey are aspects of the one you are also on. The life path that teaches us to trust, to surrender and to enjoy each day rooted in the now, without fear of tomorrow. What a welcoming committee I had as I made my move to Florida. Hurricane Hermine, the first hurricane to hit land in Florida since 2005, was moving right through our driving route. 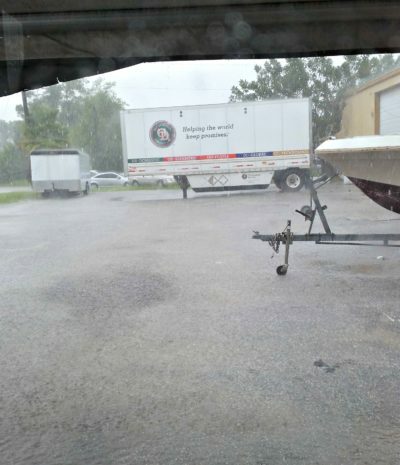 We delayed our arrival by a day, swung wide west to get around it and finally arrived in time to be welcomed by a huge downpour that shook the trailer. I sat there and wondered, “What was I thinking?” I had moved to the land of sinkholes, alligators, giant bugs and hurricanes. I did a quick inventory of all of the other times in my life that I had to start over. When I moved away to college, when I got married and first moved to Buffalo, when I got divorced and had to re-define who I was – the list was long and served to remind me that “I’ve got this.” I know how to start a new chapter. I’ve done it before and I can certainly do it again…as long as the alligators don’t get me!